New research has found the overwhelming majority of Melbourne parents drive their kids to school with parental fear and convenience holding kids back from walking to school independently. The VicHealth, University of Melbourne, Australian Catholic University and RMIT research found more than 70 per cent of parents who travel with their kids to school drop them off by car, even those living less than 750 metres from their school. The preliminary research findings revealed most parents drive their kids to school on the way to other destinations, like work or the supermarket. Another key barrier for parents is fear, with a VicHealth survey revealing over 40 per cent of parents cite stranger danger as the key reason they don't let their kids walk to school. The research showed kids who travelled independently of their parents were the most active with 80 per cent walking, riding or scooting to school rather than catching a bus or getting a lift with friends. Researcher Dr Alison Carver said the study highlighted the importance of supporting parents to allow their kids to travel to school independently. "Our research shows independent kids are more active kids. Kids who travel with their parents to school are more likely to be driven and are less likely to walk, ride or scoot," Dr Carver said. "We know there are several factors behind this including, parents fitting the pickups and drop offs into their busy schedules, the distance to school and the walkability of their neighbourhood. "We also know that many parents are scared to let their kids travel to school by themselves, which is why programs like VicHealth's Walk to School program is so important – it encourages kids to build their skills to be able to walk to school safely and for parents to feel comfortable because lots of families are doing it." VicHealth CEO Jerril Rechter said while it was natural for parents to be fearful, taking part in the Walk to School program was a good first step towards supporting their kids to walk to school by themselves. "Despite the fact that over 60 per cent of Victorian parents want their kids to be active on the way to school, we know fear is a strong barrier stopping their kids from walking to school independently," Ms Rechter said. "It's really natural for parents to feel anxious about letting their kids walk to school and as parents you're in the best position to judge when your child is ready to walk to school independently. "We've found that for many parents, taking part in programs like Walk to School is a great step towards reducing their fears. "The more families in your area walking to school the safer, and more fun, it'll be for your kids." Ms Rechter said with childhood obesity rates on the rise it was really critical that parents were encouraged to help their kids get a bit more physical into their day. "Less than a fifth of kids get enough daily physical activity to be healthy and it's really having an impact on their health, with a quarter of kids overweight or obese," she said. "Walking, riding or scooting to and from school every day – even if it's only part of the way – helps kids get some of the physical activity they need to be healthy. "We encourage parents and carers to support their kids to take part in the Walk to School program – it's a great way to teach them the benefits of being active and see their confidence improve." Question: Can you tell us about the Walk to School program? Rayoni Nelson: Every October, VicHealth's Walk to School program encourages Victorian primary school kids to walk, ride or scoot to and from school. It's a great way to help students learn healthy habits and achieve the recommended 60 minutes of physical activity, every day. It also encourages primary schools, local councils and communities to make active travel easy, safe and accessible. Question: Why did VicHealth begin the Walk to School program? Rayoni Nelson: Currently the majority of Victorian kids are driven to school by their parents whereas in the 1970s around half of kids walked to school. 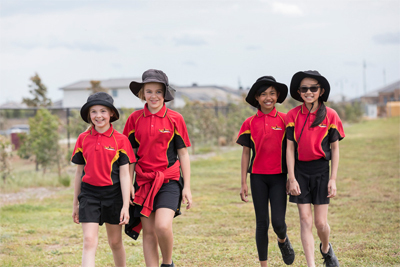 To counter this trend VicHealth has been running the Walk to School program for 13 years to increase the physical activity levels of children in Victoria and to help encourage families to live a more active lifestyle. The Walk to School program is about supporting schools and families to make walking, riding and scooting to school fun, easy and achievable. Question: What do you hope to achieve from the Walk to School program? Rayoni Nelson: Walking, riding or scooting to and from school every day – even if it's only part of the way – helps kids get some of the physical activity they need to be healthy. Less than a fifth of kids get enough daily physical activity to be healthy and it's really having an impact on their health, with a quarter of kids overweight or obese. Taking part in the Walk to School program is a great way to teach kids the benefits of being active and support them to build healthy habits for life. Question: Can you tell us about recent research into parents who walk their kids to school? Rayoni Nelson: VicHealth, University of Melbourne, Australian Catholic University and RMIT research has found more than 70 per cent of parents who travel with their kids to school drop them off by car, even those living less than 750 metres from their school. The preliminary research findings revealed convenience was a big factor with most parents driving their kids to school on the way to other destinations, like work or the supermarket. Another key barrier for parents is fear, with a VicHealth survey revealing over 40 per cent of parents cite stranger danger as the key reason they don't let their kids walk to school. Question: Do you think this is decline is because most parents have had to return to work? Rayoni Nelson: While convenience is a big factor, with many parents driving their kids to school on route to work or other trips, fear still holds many parents back from allowing their kids to travel independently to school. VicHealth hopes that by encouraging more families to walk to school the safer, easier and more fun, it'll be for your kids. Question: How can parents teach their children about stranger danger and safe methods to take when walking to and from school?